There are many unique roses to be discovered in Washington Park in Portland. You wouldn’t expect to find a formal English rose garden like this in the middle of Portland! 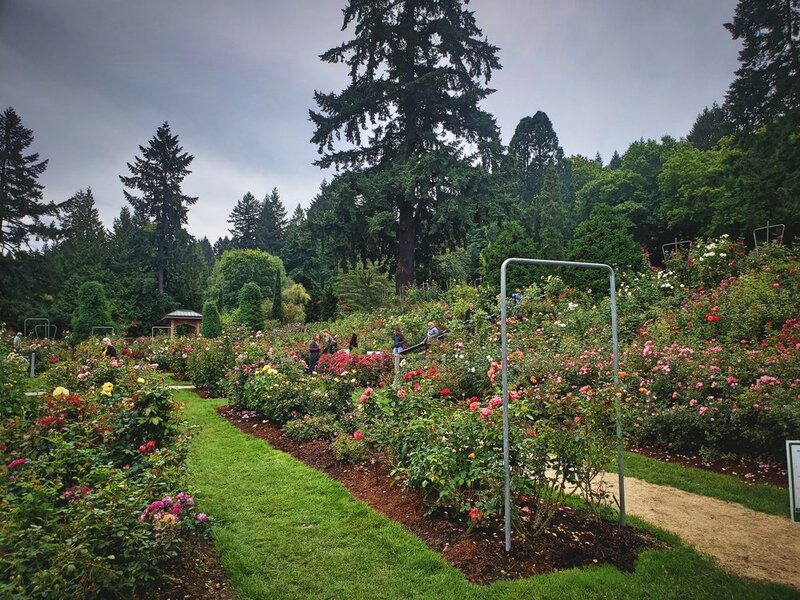 Portland might be known for hipsters, coffee, and bicycles, but just up the hill from downtown, there is a formal English rose garden that would surprise any visitor. The International Rose Test Garden is tucked into the sprawling Washington Park, which also contains a Japanese Garden, a zoo, a children’s museum, a veterans’ memorial, and miles of walking and bike trails. Colorful houses in a funky neighborhood near Portland’s International Rose Test Garden. 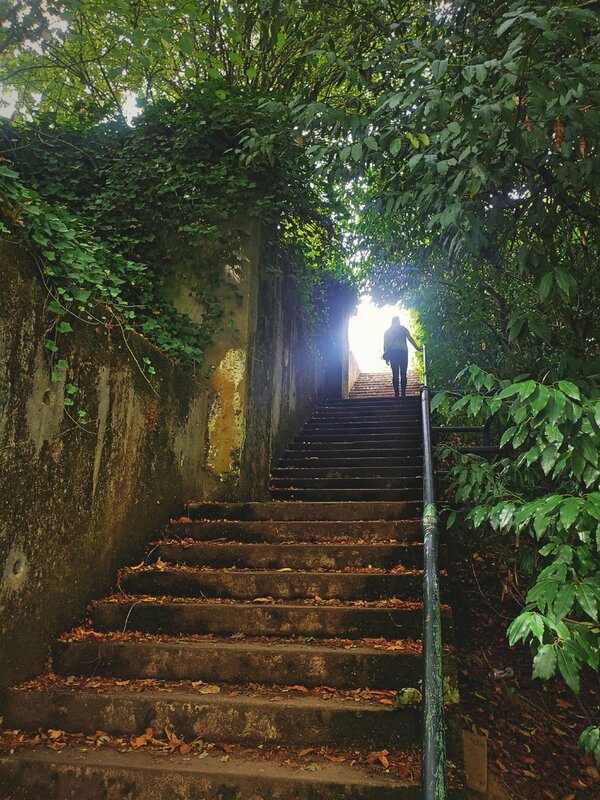 There is more to explore in Washington Park than just the International Rose Test Garden. The International Rose Test Garden has more than 10,000 rose bushes and about 650 different varieties of roses. The roses in the Test Garden are evaluated on characteristics like disease resistance, color, shape and even fragrance. 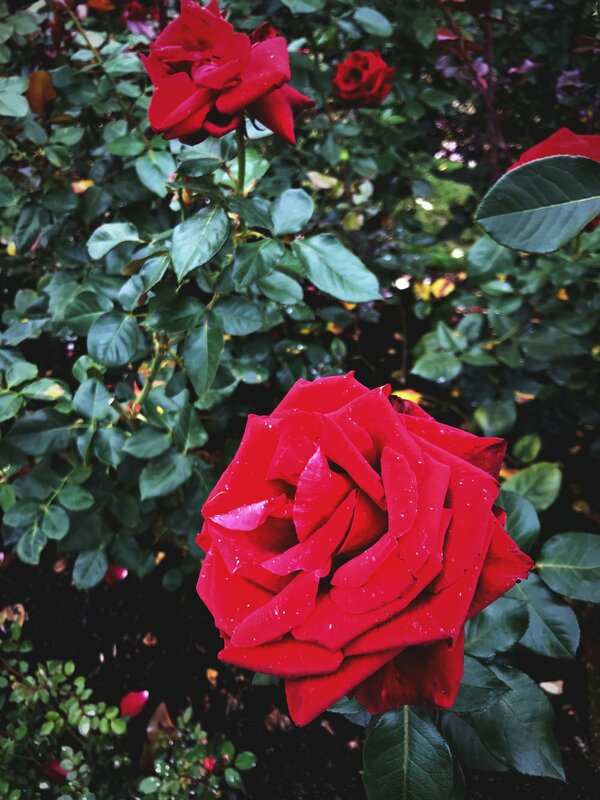 Portland’s love affair with roses began in 1905 when Portland’s streets were planted with rose bushes for the Lewis and Clark Centennial Exposition. Today people can still see how Portland earned its name as the City of Roses by visiting the International Rose Test Garden in Washington Park. We visited Portland and the International Rose test Garden in mid-September. While the peak bloom may be from July to August, there were still thousands and thousands of blooms—so many blooms that the air smelled like a dream. The fragrant scent is even more surprising when you consider that the garden is located in the middle of Oregon’s largest city. There are so many varieties of beautiful roses at Portland International Rose Test Garden. The blossoms are especially pretty when they are dewy like this one. We have never seen so many perfectly manicured rose bushes—and in so many colors and varieties. Red and pink and white roses. Yellow, orange, purple, and even black roses. Multi-colored roses that look like a sunburst. Some were huge with curling loose petals, while others had tightly wrapped blossoms. There are roses growing in long, precise lines of bushes and roses climbing trellises. Make sure to check out the names on the small placards. You will not be disappointed by names like Big Momma, Archbishop Desmond Tutu, Hotel California, or Little Chap. There are small pagodas and gardens within gardens to explore in the rose garden. Many of the roses are in well-kept rows, but you’ll find other climbing walls, gates, and trellises. Besides the aisles of orderly award winning varietals of roses in the Royal Rosarian Garden, there is also the Shakespeare Garden. Shakespeare said, “Of all flowers methinks a rose is best,” and you can almost picture Hermia or Helena pining unrequited love among the blossoms. The Secret Garden was one of our favorite parts of Washington Park. Kaylee climbing the stairs to exit the park toward Arlington Heights.